First things first – fuelling up! 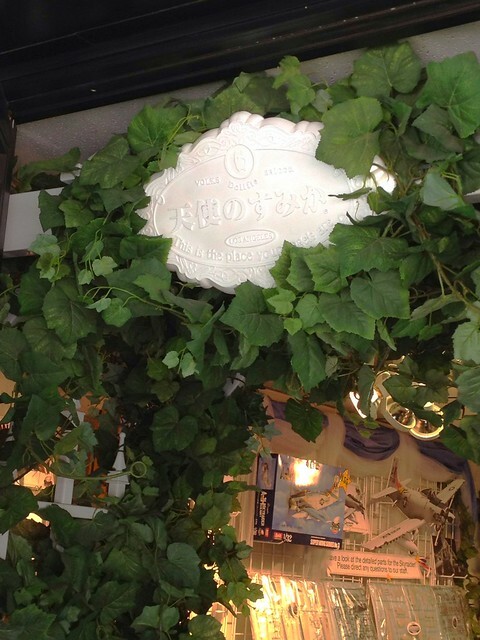 We had a gluttonous breakfast at Polly’s Pies, and then went over to the Volks USA showroom. 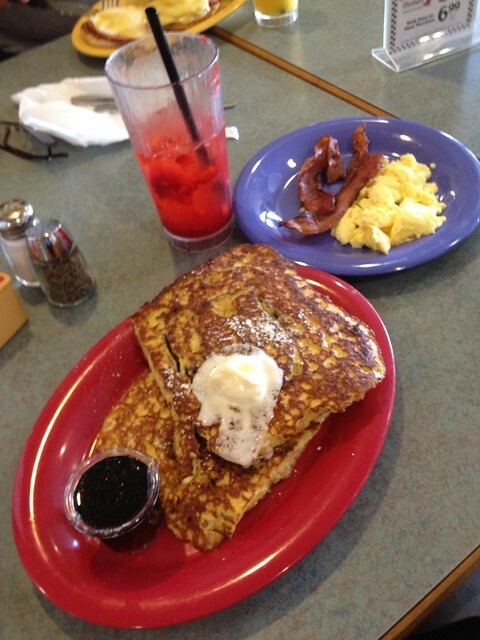 Here’s the obligatory food pic of my breakfast – Cinnamon Roll French Toast with bacon and eggs and strawberry-lemonade! The Volks store is in a out of the way location, and there is no obvious signage, but once the store is opened there is a pretty “Tenshi-no-Sumika” plaque hanging in the doorway. 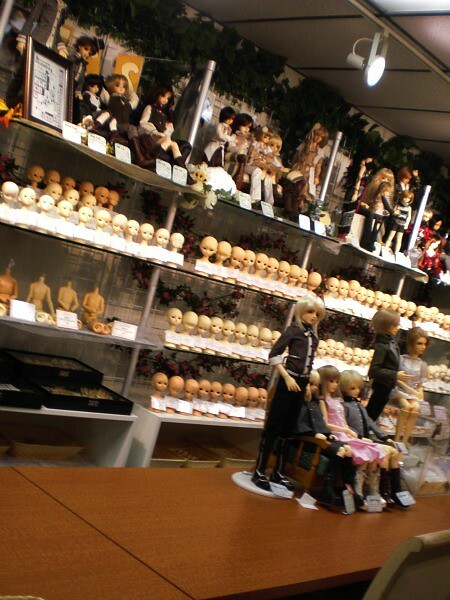 On the second floor of the showroom is the Super Dollfie and Dollfie Dream related merchandise. The LA showroom also offers the Super Dollfie Full-Choice system so there’s a wall with all of the head models on display so that prospective owners can put together a test version of their doll before completing their order. 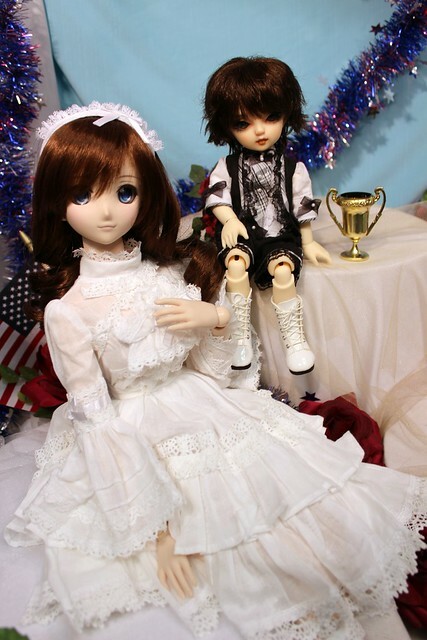 Photo from Volks USA Blog. Photos aren’t allowed in the store, but I snapped on by accident when I was putting my phone away – so here’s what part of the wig wall looks like, and the “new releases” table with some new wigs on it. 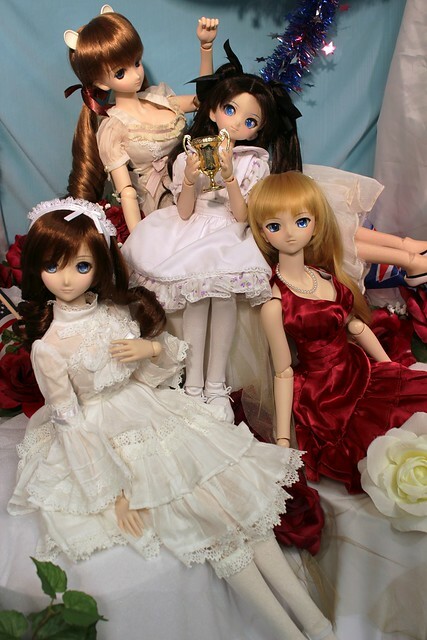 I brought 2 of my Dollfie Dream dolls with me: Aerie, Rin; and also my sister’s yo-SD Sora. Machiko had sent me with a mission to find a new wig for Sora! The staff at the showroom were very nice, and even let me try a couple of wigs on him to see how they looked before buying one. Of course, this got dangerous since I liked several styles for my own girls and ended up buying a couple of wigs for them too! 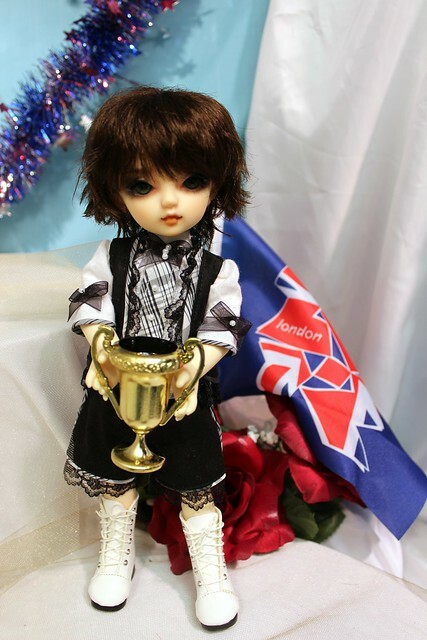 Here’s Sora sporting his cute new wig – it suits his faceup so much better than the light brown one he arrived with! I got to meet Bailey, Dandy, Jane and Kayo, who’s names I sometimes read on the Volks USA blog, but it was nice to have faces to put to the names. After some chatting and shopping, we went down to the main floor to take pictures in the photo space. In honour of the summer Olympics it was decorated with a London & Olympic Games theme. 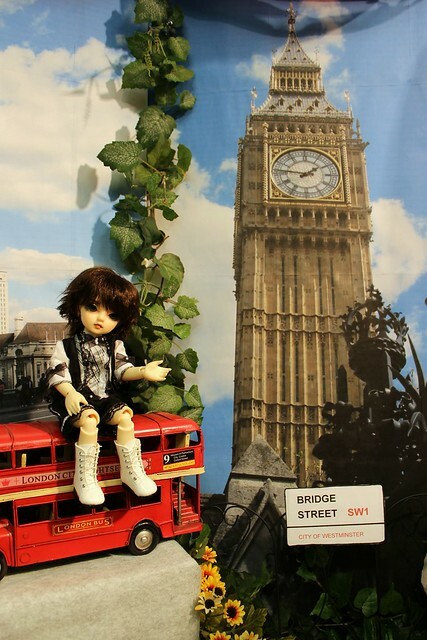 There’s a cute park bench, a mini double-decker bus and a backdrop of London. Here BerzerkFuryZero’s Kiriha has captured InnocentSaké’s Momoko! Oh no! 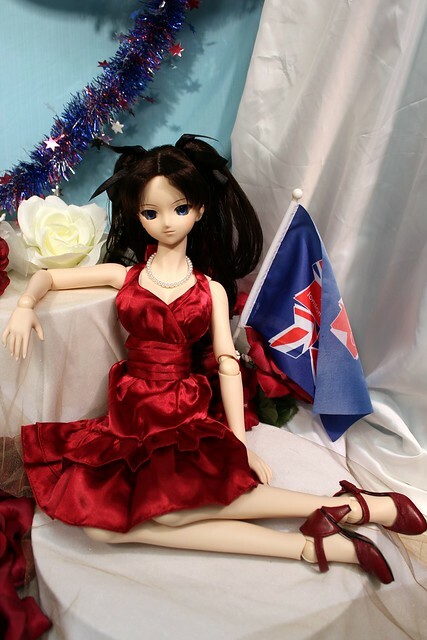 Rin felt very at home and relaxed in the Volks store. 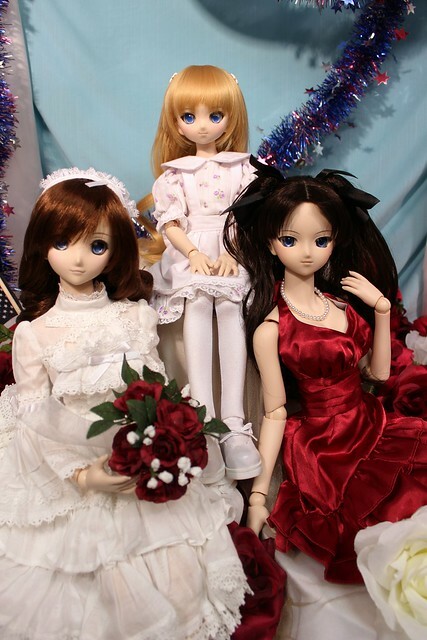 Here are Aerie, Cirno and Rin looking lovely in the photo space. Vicky really wanted to try Rin’s default wig on Cirno, so I helped her put it on. Cirno makes an adorable Chibi-Rin doesn’t she? Since Cirno borrowed Rin’s wig, Rin put on the lovely blonde wig that Cirno had been wearing. I’m not sure how I feel about Rin as a blonde, but it brought out the peach in her cheeks a bit more. Here are the girls goofing around – Cirno is the champion! Here’s little Sora hanging out with his aunti Aerie. I must confess that this was my first time actually handling a Volks yo-SD doll and I was failing miserably at making him sit and pose >;__<;” Luckily Dandy was there to show me the neat clicking system that yo-SD’s have in their hips and knees to make them pose better. Thank you to Innocentsaké, David, BerzerkFuryZero, Kenny_Ngyuen and Vicky for coming out so early on a Saturday morning to hang out with me. It was so lovely to meet you all, and fantastic that I was finally able to visit the Volks USA showroom! I hope to be able to visit LA again soon! 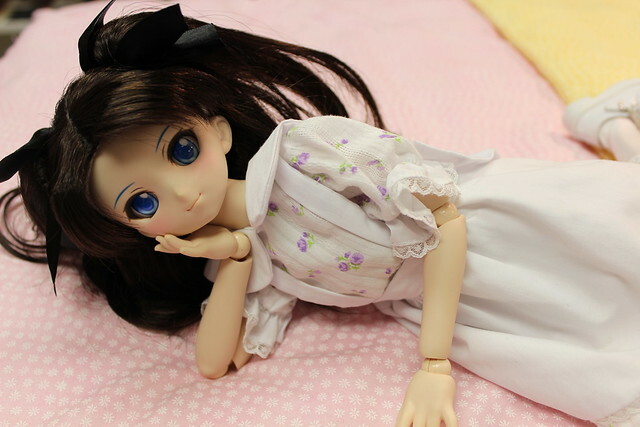 This entry was posted in Doll Meetup, Dollfie Dream, Volks Super Dollfie and tagged Aerie, Dollfie Dream, Rin by archangeli. Bookmark the permalink. Wait, what?! Why? 😦 If I’m not mistaken, it’s the Volks store in LA right? The one that actually supplies Volks in the US?